I have to confess that I am positively in love with these counting bean bags I designed over the holidays (yes, yes, calling making bean bags designing is a bit of a stretch--I know)--I love the white muslin fronts with the bright applique numbers and the way they feel in your hand and their sweet simplicity. They just seem wholesome and good somehow. You get that, right? Perfectly sized for throwing across the room at people when they either say rude things or you need their attention--also, they won't leave marks on the face. See what I mean? The possibilities are endless. And if you really do not want to make your own but would like the convenience of a set of these arriving in a nice little package delivered direct to your doorstep--you are in luck because I will be putting a couple of sets up in my shop very soon. oh man! I made beanbag sets for friends kids for christmas this year, and they were nowhere near as cute as yours! guess i'll have to make my own toddler a set! thanks for the tutorial, too! Cute bags! My little boy will love them. Thank you for sharing. Adorable! 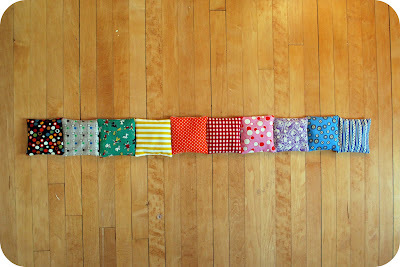 My little one is in the teething stage, so if I make a set now, they'll be around for a long time! 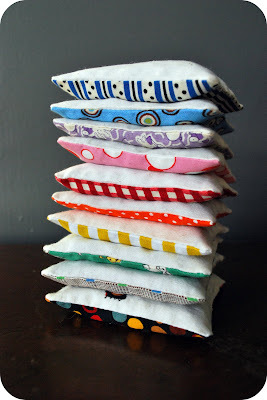 Simple and lovely...this sewing newbie can't wait to make them. Thank you for sharing your wonderful tutorials. I want to make them all! I needed some of these for classroom games last year.. THIS is the year for making them. Thank you SO MUCH!!!! Wow, thank you!!! It's a great idea!!! I'm loving this! I really hope I have time to make them for a 3 year old's birthday later this month. Otherwise I'll remember them for future gifts for my Godchildren. So charming! Wooow, these are amazing. What a great idea! Could the back have items... like, for number one, one dot, two-two dots, three- three dots? Or even the same set, but with Chinese/Arabic/other number systems? Very cool idea. It's awesome, and I can't wait to make a set. Absolutely Adorable, I love these! I cracked up about the fact that they don't leave marks on the face! 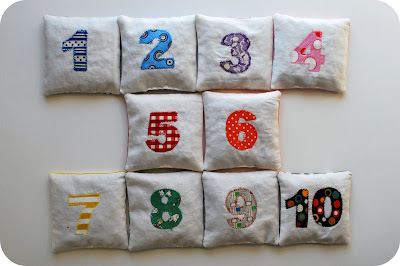 These are really cute and much cuter than the very quick and utilitarian ones I made for my now 3 1/2 when he was 18 mo. New set may be in store. these are very cute and I really like all the ideas you have for using them. I especially like the idea of throwing them across the room at people. I may have to make a stash for myself to throw at my husband. hehe, I kid! I am loving this soooo much, that I now know exactly how I am going to spend my evening after the little ones are in bed! I have an almost-two-year-old who will be over the moon about these! Thanks so much for sharing. Super cute. My friend is having a baby i think this will go well as a gift as the baby grows! love them! thanks so much! i linked. Thanks to everyone and their comments--please share photos of your bean bags design in the Beeper Bebe flickr pool. I would love to see them. 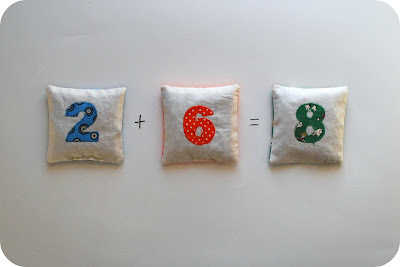 Love the number idea...I might have to try this out! Thank you for all of your creative inspiration...loving your blog. my little counter needs some of these for our growing collection of things to count. What a great idea, thanks for sharing!!! I made bilingual ones (Chinese characters on the other side) for my niece. I used remnant fabric from the baby quilt I made for her last year - she's getting a kick out of matching each beanbag to one of the squares on her quilt. Thank you!! Thank you! Your blog post will be advertised on the DigiFree Craft Items search engine today (look for timestamp: [16 Jan 02:50am GMT]). I made these (or at least, pretty close -- I made them with letters! ), and I adore them. Thank you sooo much for sharing your pattern, they came out great and the kids just love them. Hi, thank you for the tutorial for the bean bags and the alphabet magnets. I combined them into one, that I am hoping will work out good! I have alphabet bean bags, but never thought to make number ones...what a great idea! Thanks for sharing. Yours turned out beautifully. Ooo what a great tutorial! I made beanbags back when I used to teach, but they were nowhere as adorable as yours. Love them! 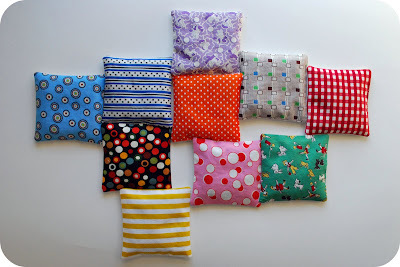 I will be heading to the fabric store today to find myself some cute fabric to make some beanbags for my little man! Made these in one evening. My toddler loves them. Great idea! Thanks for sharing. What a great idea! And, very cute to boot. Thanks for the great tutorial! I've posted it on my blog, because I *need* to make these! Very innovative! I know a few toddlers that may need these soon. Thanks! Thanks for sharing these, I'd love to make some with my fabrics for my son, I made some lavender squares, but these are much more fun. will come back when they are done! Love your blog. I did it! Thank you for lovely inspiration and pattern! Hi Holly, I finally, finally got round to making these for my little boy. Thanks for the inspiration, I had lots of fun and so did Stanley! Thank you so much for your great tutorial Holly. I had been eyeing it out for a few days now and made my set today. Thank you so much for sharing! I'm going to post a link for this tute on my blog. 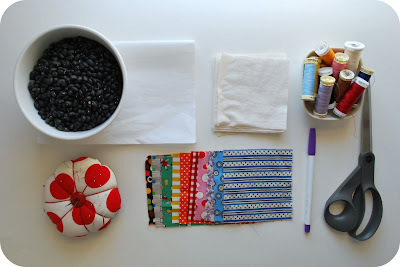 I'm a homes-school mom who loves fabric and crafts! This is such a fun idea and this will be a helpful tool for children who need tactile stimulation! hi, just wondering if there is a good reason to not use red lentils instead of beans? There is absolutely no reason you could not use red lentils--or rice for that matter. Improvise away. I am going to make a set of these for my toddler for Christmas. Excellent crafty idea. Thanks! fantastic idea and beautiful too. Must try! brilliant idea - must make! Great idea. Thank you so much. Making them for my grand daughter's birthday. Great idea. Thanks. Making them for my grand daughter's birthday. Awesome idea! I have indeed make one set for my little one, and I have blog it and add a link to you. It was really a fun and easy tutorial. It lasts longer than the polystyrene does. Because it has high density, it shapes your bean bag chairs into a firmer form and a bit stiff. wow, awesome. great idea to add an educational pattern on the bean bag. Kids will love it. Just made these and they turned out so well!!!! I can't to give them to my son - thank you!!!! Thank you so much for the tutorial! I'm a very novice sewer and your instructions were easy to follow and I now have a beautiful bean bag set! Thank you again! Fantastic! I' ll do this for our little 36 and 3month old nieces.Thanks a lot! I appreciate! !